With the holiday shopping season coming to a close and the holidays right around the corner, you may be starting to make arrangements for how you are going to actually spend the day you have planned so earnestly for. Some are staying home, others are hosting parties. Either event involves being in a comfortable and cozy situation and one way to truly feel ready for the holidays in this situation is to get yourself and your home in the holiday spirit. Today, we will look at a couple of brief ways your Mac and iPhone can help to enhance your holiday. The first great way to add a bit of holiday spirit to the home is through photos. They are able to bring back memories from holidays from last year or even when you were a child. There are two ways this can occur on Apple items. On Mac, you can easily do this through iPhoto. For iOS devices, you can create a nice slideshow through the photos app pre-loaded on all iOS devices. Going the Mac route is easy because all you have to do is hit play and let iPhoto do its thing. 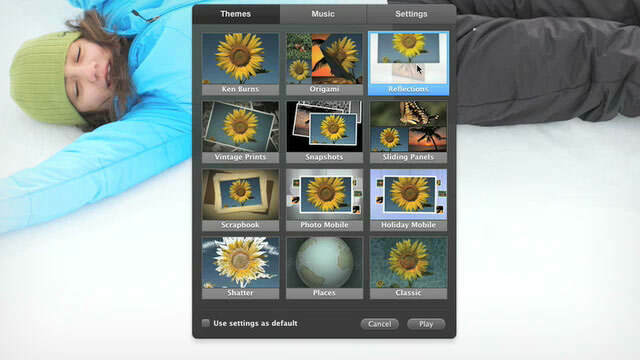 After launching iPhoto, collect all of the photos you want to include in the slide show. Then, after placing them in a folder either by dragging them in or selecting them all, going to File -> New Album. By clicking either the slideshow button found in the center or File -> New Slideshow, your Mac will enter full screen mode and your iTunes library will play randomly. To adjust settings, click the settings wheel. You can adjust photos and music settings there as well. Your second option is playing a slideshow through your iOS device. This can be done by creating an album either on your device itself or through iPhoto, syncing to transfer. Your iPhone can also play music in the background during a slideshow, however you don’t have a large variety of settings. Lastly, you’ll need a sturdy stand to show off your slideshow. Some may say that music is a much better way than photos to bring back holiday memories and to brighten up your mood. If this is the case for you, then it’s very easy to make a holiday playlist in iTunes. You’ll have to purchase the songs, however once they are in iTunes, you can create them into a playlist by selecting the songs, and then clicking File -> New Playlist, or simply Command+N. iTunes also has holiday specials on classics, usually offering them at either a cheaper price or in a bundle just during the season. However, there is a chance that you don’t want to pay a boatload for your music, but you also don’t want to find yourself in jail on Christmas morning for copyright issues! If you want to find a way to legally have holiday tunes for free, you still have a couple of options. 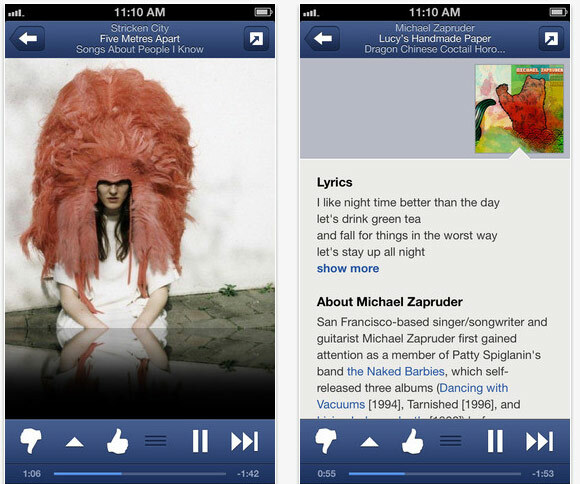 Pandora – The free radio application allows you to listen to music for free based on the genre or artist, rather than a specific song. This garners a much better chance of not only hearing the song you like, but to discover new songs as well. Pandora is a great way for you to keep your songs holiday focused, making it seamless and easy to hit play and have the tunes fill the house for the whole day. Spotify – Based on stations, this Internet radio allows for more flexibility in your enjoyment of music. Hear a song that you like, even with their free version, Spotify allows you to tap to save for later. Have Spotify Premium, you get to also listen to songs while away from WIFI. Soundcloud – Wanting to spice up Christmas classics? Soundcloud is the perfect way to get a break from the classics and hear original music from the Soundcloud community. All for free, Soundcloud is also available through their website as well as through iOS. Also, you can contribute to the Soundcloud community by interacting or posting your own creations in a snap. What better way to bring in the holiday spirit than through smells and tastes of the holidays. There are many iOS applications available on the market today that allow you to easily create holiday treats and drinks to serve at your next holiday party. Epicurious is the well-rounded application that allows you to easily learn how to make some of your favorite dishes and snacks with step by step instructions. With the shopping list feature, you can easily go out to the store to replenish your kitchen when supplies for the party are running low. If you are looking for an application gearned more toward drinks, then the Mixology for iOS application is what you’re looking for. With thousands of drinks, separated by category, and with well descriptive instructions, you can easily become this year’s holiday bartender. If you want an application that can easily organize everything you’ve found in food and drinks, Evernote is a great note-taking application made available on Mac, iOS, Windows, and more. From music to food to drinks, what are some ways that you are adding holiday flair to your home or party?